The Samokhodnaya Ustanovka 85 (SU-85) which means self-propelled platform with 85mm gun, in this case the 85mm D-5S anti-tank gun. Where the SU-122 was essentially a mobile assault howitzer, Soviet planners realized that the new German Tiger and Panther tanks could withstand the 76mm main gun of the T-34/76 except at closer ranges and a newer and specialized anti-tank gun was required. The answer came as the D-5T which was a high-velocity 85mm gun that was mounted on the same chassis as the SU-122 becoming the D-5S and providing the Soviet armies with an effective counter the German cats (Tiger and Panther). Production of the SU-85 ended when the T-34/85 entered production armed with the same gun. As German forces advanced, they collected a variety of abandoned Soviet armored vehicles, many of which were retrofitted with German equipment before being placed into service against the original owners. 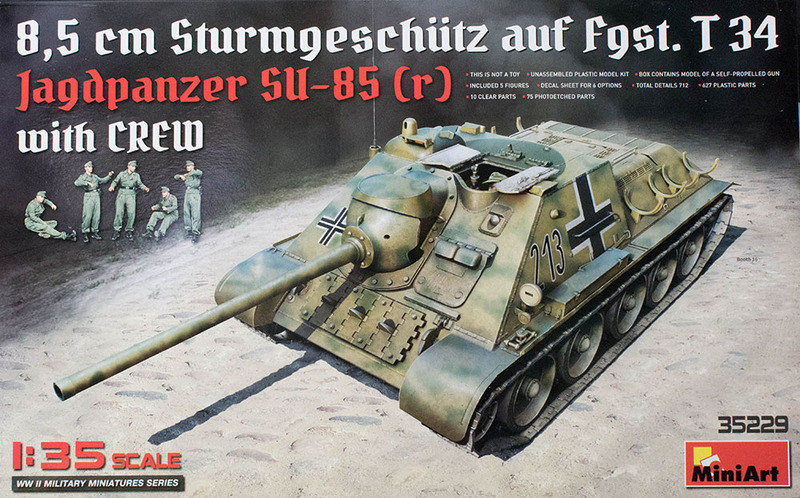 There have been a variety of SU-85 kits produced over the years but none have approached the level of detail that has just been released by MiniArt. This is a reissue of the SU-85 without interior but with a set of German crew figures. This kit is presented on 74 parts trees plus one tree of clear parts (duplicate trees not shown) and one fret of photo-etched parts. According to the manufacturer, there are 637 plastic parts and 75 photo-etched parts in this box. I believe it as there is some serious mass to the box when you pick it up. There is a lot of kit here for the money and lots of detail to keep you busy. Given the number of small parts and intricate painting required to get this all together, I recommend this kit for experienced modelers with good tools. Decals and color profiles are provided for three SU-85(r) early production and three SU-85(r) late production examples in Wehrmacht service. One note here, where some of the recent MiniArt releases featured painting instructions using Mig paints (which is fine if you have access to Mig paints), MiniArt has resumed using paint instructions calling out Mig, Humbrol, Mr. Color, Testors, and Vallejo paints. Thank you MiniArt! If you want a nice kit of a Soviet Army cat hunter, even if it is under new management, this SU-85 is their nicest kit produced to date and they offer another version with the interior for those that prefer even more details in their build.